Experience culture, whimsy, and shopping hotspots on this private 5-hour tour in Playa del Carmen. 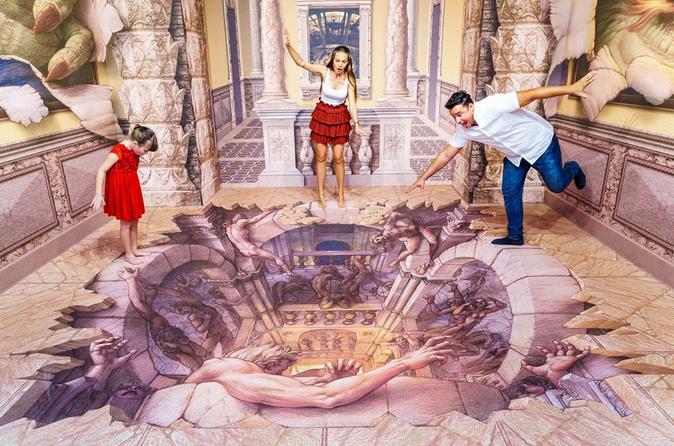 Inside the 3D Museum of Wonders, discover 43 interactive exhibits where you can become part of the stranger-than-life images. Then, browse the trendy boutiques along 5th Avenue (Quinta Avenida). Stop by the Frida Kahlo Restaurant for a refreshing drink and learn about the famous artist. Best of all, enjoy these places in the company of just your family and friends. This tour accommodates up to six people and includes round-trip hotel transport. Create memories special to your select family and friends, while enjoying personalized service, on this private 5-hour tour of Playa del Carmen. Enjoy afternoon pickup from your hotel and travel with your personalized guide to the 3D Museum of Wonders. All located on one floor, the 43 exhibits are in 3D and interactive. Have a blast taking photos of in front of strange scenarios--such as one of you riding a horse barefoot and falling into the abyss. After the museum, immerse yourself in the shopping haven along 5th Avenue (Quinta Avenida). Feel free to ask your guide for recommendations on where to go depending on your preferences. With bags in hand, rest with a provided soft drink at the Frida Kahlo Restaurant. Take a look around at Frida Kahlo's art and hear about the artist herself. If you choose to have dinner here before returning to your hotel, enjoy a special discount for your meal. Bring comfortable shoes, camera and extra cash for personal expenses.